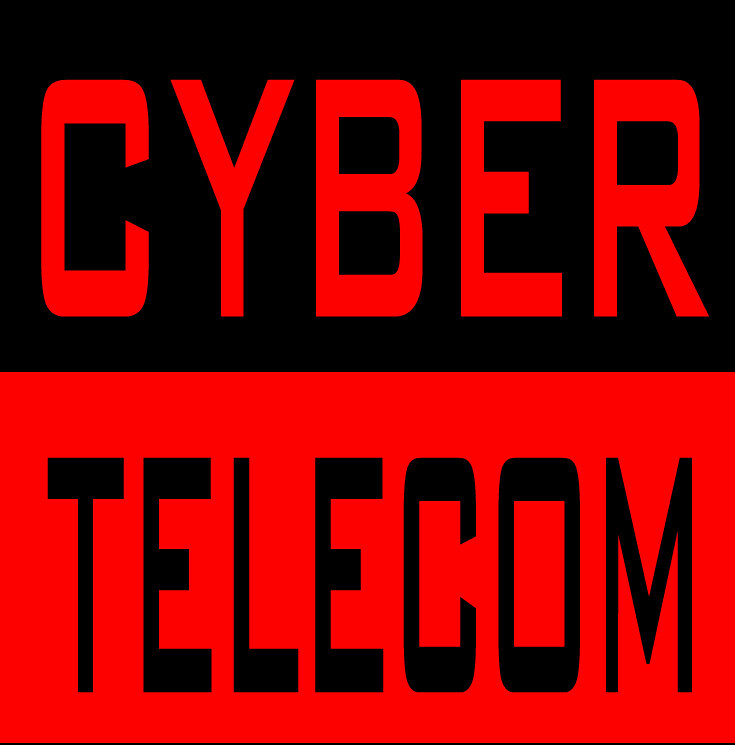 Cybertelecom News regularly leads with technology related quotations. This is the collection from which those quotations are pulled. 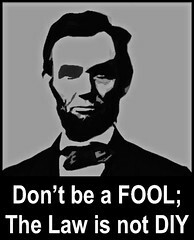 I have been doing this for over a decade and most of these quotes I have obtained from multiple sources. Occasionally I note where one of the sources comes from. Its one of the largest and most brazen thefts of intellectual property ever committed in the United States. -- Jack Valenti, head of the Motion Picture Association of America, quoted in Kevin Maney, Little Net Firm Rocks TV Giants, USA Today, Feb. 8, 2000 at A1 commenting on iCraveTV. "I say to you that the VCR is to the American film producer and the American public as the Boston strangler is to the woman home alone." Testimony of Jack Valenti, President of the Motion Picture Association of America, before the U.S. House of Representatives Subcommittee on Courts, Civil Liberties and the Administration of Justice, Monday, April 12, 1982, see http://www.cryptome.org/hrcw-hear.htm for complete transcript. "Like many businessmen of genius he learned that free competition was wasteful, monopoly efficient. And so he simply set about achieving that efficient monopoly." Mario Puzo, The Godfather, Referring to Don Vito Corleone. "It would be gross understatement to say that the Telecommunications Act of 1996 is not a model of clarity. It is in many important respects a model of ambiguity or indeed even self-contradiction." Supreme Court Justice Scalia in AT&T v. Iowa Public Utilities Board, January 25, 1999. "Like it? Well I don't see why I oughtn't to like it. Does a boy get a chance to whitewash a fence every day?" There are three possible roads to ruin - women, gambling and technology. The most pleasant is with women, the quickest is with gambling, but the surest is with technology. - Georges Pompidou, Sunday Telegraph 1968. "We could put it on the Internet!" "No, we have to reach people whose opinions actually matter." The PC is the LSD of the 90's. - Timothy Lear, in the " London Guardian"
We obtain better knowledge of a person during one hour's play and games than by conversing with him for a whole year - Plato. Incomprehensible jargon is the hallmark of a profession. - Kingman Brewster, Jr. So little time...so much to know." "I can't believe that!" said Alice . "We have guided missiles and misguided men." -- Dr. Martin Luther King, Jr.
"During my service in the United States Congress, I took the initiative in creating the Internet." - Al Gore, Jr. It seems reasonable to envision, for a time 10 or 15 years hence, a 'thinking center' that will incorporate the functions of present-day libraries together with anticipated advances in information storage and retrieval. The picture readily enlarges itself into a network of such centers, connected to one another by wide-band communication lines and to individual users by leased-wire services. In such a system, the speed of the computers would be balanced, and the cost of the gigantic memories and the sophisticated programs would be divided by the number of users. - J.C.R. Licklider, Man-Computer Symbiosis, 1960. It soon became obvious that the ARPANET was becoming a human- communication medium with very important advantages over normal U.S. mail and over telephone calls. One of the advantages of the message systems over letter mail was that, in an ARPANET message, one could write tersely and type imperfectly, even to an older person in a superior position and even to a person one did not know very well, and the recipient took no offense. The formality and perfection that most people expect in a typed letter did not become associated with network messages, probably because the network was so much faster, so much more like the telephone. - J.C.R. Licklider , Albert Vezza, Applications of Information Networks , Proc of the IEEE, 66(11), Nov 1978. We will soon be living in an era in which we cannot guarantee survivability of any single point. However, we can still design systems in which system destruction requires the enemy to pay the price of destroying n of n stations. If n is made sufficiently large, it can be shown that highly survivable system structures can be built. - Paul Baran, On Distributed Communications, Volume I, 1964. "For over one hundred years, the public switched telephone network has served our needs for communications infrastructure in the United States , reaching most of the population with a ubiquitous, reliable, and easy-to-use telecommunications technology. But today's networking communications technologies can empower scientists, researchers, educators, business people, policy makers, and citizens with the ability to access, create and distribute information much more powerfully and quickly than ever before. Such empowerment represents the true potential of the Information Age." NSFNET Final Report (1995), p. 4. "Infrastructures, for purposes such as transportation and communication, have long been vital to national welfare. They knit together a country's economy by facilitating the movement of people, products, services, and ideas, and play important roles in national security." NSFNET Final Report (1995), p. 4. When I took office, only high energy physicists had ever heard of what is called the Worldwide Web.... Now even my cat has its own page. President WM. CLINTON, during announcement of Next Generation Internet initiative, 1996. Is it a fact, or have I dreamt it -- that, by means of electricity, the world of matter has become a great nerve, vibrating thousands of miles in a breathless point of time? NATHANIEL HAWTHORNE, The House of the Seven Gables. 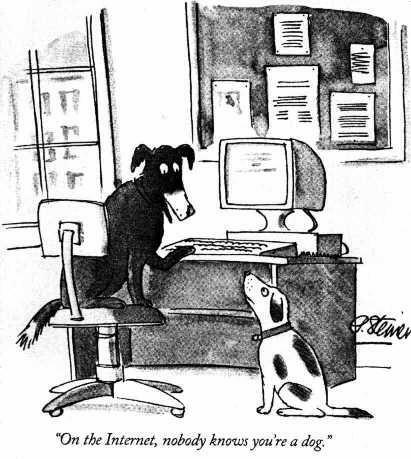 "On the Internet, Nobody Knows You're a Dog." Peter Steiner. The New Yorker, page 61 of July 5 (Vol.69 (LXIX) no. 20), 1993. AT&T CEO Ed Whitacre said: "What they [Google, Vonage, and others] would like to do is to use my pipes free. But I ain't going to let them do that..Why should they be allowed to use my pipes?" So we went to Atari and said, 'Hey, we've got this amazing thing, even built with some of your parts, and what do you think about funding us? Or we' ll give it to you. We just want to do it. Pay our salary, we'll come work for you.' And they said, 'No.' So then we went to Hewlett-Packard, and they said, 'Hey, we don't need you. You haven't got through college yet.' -- Apple Computer Inc. founder Steve Jobs on attempts to get Atari and H-P interested in his and Steve Wozniak's personal computer. There is a lot of angst out there in the newsrooms of America about our future but it is ill-founded. Our future is very strong as far as I'm concerned. No new medium has ever replaced an existing medium in the history of mass communications. Those who say newspapers are dinosaurs are wrong; newspapers still have a very important role to play in a democratic society. -- William B. Ketter, editor, the Quincy (Mass.) Patriot Ledger, and former president of the American Society of Newspaper Editors. There is not the slightest indication that [nuclear energy] will ever be obtainable. It would mean that the atom would have to be shattered at will. - Albert Einstein, 1932. "Inventions reached their limit long ago, and I see no hope for further development," - Julius Frontinus in the first century A.D.
"I must confess that my imagination refuses to see any sort of submarine doing anything but suffocating its crew and floundering at sea." - H.G. Wells, British Novelist, 1901. "Professor Goddard does not know the relation between action and reaction and the need to have something better than a vacuum against which to react. He seems to lack the basic knowledge ladled out daily in high schools." -- New York Times editorial 1921. Radio has no future - Lord Kelvin, ca. 1897. I have traveled the length and breadth of this country and talked with the best people, and I can assure you that data processing is a fad that won't last out the year. - The editor in charge of business books for Prentice Hall, 1957. But what ... is it good for? -- Engineer at the Advanced Computing Systems Division of IBM, 1968, commenting on the microchip.